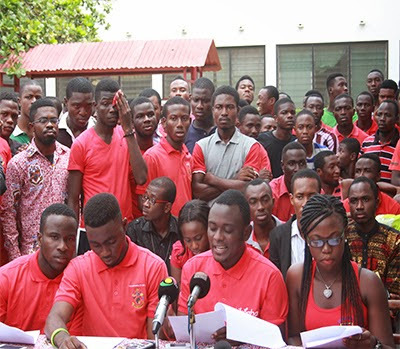 Students of the University of Ghana, Legon have accused government of trying to use diabolic means to force them to pay utility bills in order to generate revenue to address economic challenges. According to the Junior Common Room (JCR) Presidents of the University, the Mahama administration started losing credibility with all students when it gave hint of the payment of their own utility bills. The JCR Presidents, led by Adams B.H.W Hussein, at a media briefing on Wednesday dubbed ‘Yen tumi ntua’ – meaning we cannot pay–disclosed that if government goes ahead to impose the utility bills on students, they would not hesitate to vote out the administration in 2016. It would be recalled that the decision to make students to pay utility bills was made on March 25 at meeting attended by stakeholders in tertiary education in an auditorium of the University of Professional Studies, Accra (UPSA). “The burden on students and parents as a result of the current economic challenges is understandable enormous; therefore any attempt to worsen the plight of students and parents will hurt and incur the wrath of the people. Government is all about making decisions to better the lives of the people but when such decisions are rather going to degrade the situation and make the cost of education expensive and gradually make it a preserve for the rich at the expense of the poor and vulnerable, it is incumbent on us as students to act and act now,” Mr Hussein stated. He added that the implementation of the policy would increase the fees of students by approximately GH¢500.00. “As per our school’s modus of determination of fees, it incorporates the prevailing rate of inflation plus a 2 percent margin. Owing to the preceding, we are expecting fees to increase by not less that 20 percent since government has failed in its bid to maintain macro-economic stability by not keeping inflation rate low. The ordinary student must not be made to pay for the failure of government,” he noted. Mr Hussein disclosed that tertiary students across the country would vehemently oppose any attempts by government to force them to pay utility bills of the universities as a result of government’s failure to pay. “We are aware that the president and most of the people in government enjoyed free education so why are they trying to make it so expensive for us? We won’t pay,” an angry student quipped.